When a fire ripped through the Azan family home in the Sheepshead Bay section of Brooklyn early Monday morning, 13-year-old Avraham, who celebrated his Bar Mitzvah earlier this year in Israel, was the only member of the Azan family to escape unscathed. Now, he’s the only member of the immediate family observing the traditional seven-day mourning period. Four people were killed in the blaze, including Avraham’s mother, 39-year-old Aliza Azan; Avraham’s brothers, 11-year-old Moshe and 7-year-old Yitzchak; and Avraham’s 3-year-old sister Henrietta. Of the surviving four, only Avraham managed to escape without injury. 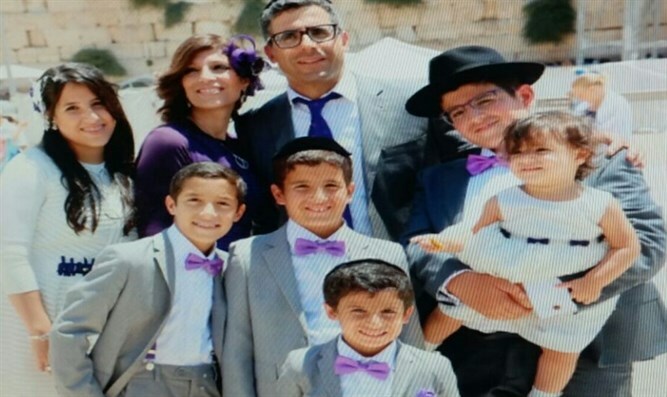 His father, 45-year-old Joseph ‘Yosi’ Azan, was critically injured, suffering burns and smoke inhalation. The family’s 16-year-old daughter, Shilat, and 15-year-old son, Daniel, were also seriously injured. While meeting with relatives after the tragedy, Avraham recalled the terrifying moments early Monday morning, and how his father risked his life to save his children. “I told him [Avraham] to be strong,” a relative of the Azan family said, Behadrei Haredim reported. Investigators say the fire was caused by an unattended menorah, which had been left to burn in front of a window on the first floor. The heat caused the glass oil holders to shatter, splashing burning out and sparking the deadly blaze. New York Fire Department Commissioner Daniel Nigro said that the father, Joseph Azan, heroically tried to save his family from the fire, running back into the house to pull his children from the building, while suffering smoke inhalation and burns which nearly cost him his life. Avraham Azan recalled his father’s valiant efforts to rescue those trapped on the second story of the house. Joseph Azan managed to save his two oldest children, Shilat and Daniel, by pushing them out from a second story window. All three are being treated at Staten Island University Hospital.